A business performs a large number of financial transactions daily. It purchases goods from suppliers and sells to its customers. It returns well to suppliers. It receives goods returned by its customers. It deposits cash in the bank and withdraws from the customers. It pays for expenses like salary, rent, stationery, advertisement and insurance premium. It borrows loan and returns it on maturity. The transactions should be recorded immediately in memorandum books and when they take place. The memorandum book is also called waste book or rough book. It is treated as a temporary record of these transactions, which helps to prepare journal. In fact, the journal is the first step of the accounting process. Journal is the first book to keep a systematic record of all the business transactions. It is the first entry of all the financial transactions. It is the original book or primary book in which the financial transaction is first recorded in order of date and helps to maintain the principal book or ledger. It is the book of prime entry in which each and every transaction is registered showing debit and credit aspects with a brief explanation called narration. "The journal or daily record as originally used was a book of prime entry in which transactions was copied in order to date from a memorandum or waste book. The entries as they were copied were classified into debits and credits, so as to facilitate they're being correctly posted afterwards in the ledger."-R. N. Carter. To present complete information of each transaction. To show debit and credit aspects or accounts involved in each transaction. Identifying the two aspects of each transaction. Identifying the appropriate accounts of these two aspects of each transaction. Recording each transaction in the journal book involving debit and credit accounts in chronological order. Identifying the debit and credit accounts of each transaction by applying the rules of debit and credit. According to the double entry system, every transaction is recorded in the journal involving its two aspects. One aspect of the transaction is debited in one account and the other aspect is credited in another account involving the equal amount. The crucial task while journalizing the transaction is to decide the account to be debited and credited. 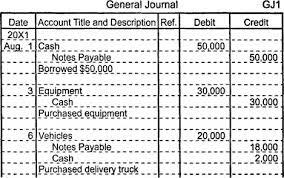 The system record of a transaction in the journal book is called journal entry, the process of passing journal entry is called journalism.The rules are also known as rules of debit and credit. Journal is the first book to keep a systematic record of all the business transactions. The record of the transactions made in the journal is called journal entry. Journalizing is the act is passing journal entry. The system record of a transaction in the journal book is called journal entry, the process of passing journal entry is called journalism. The system record of a transaction in the journal book is called journal entry, the process of passing journal entry is calledjournalising.The rules are also known as rules of debit and credit.